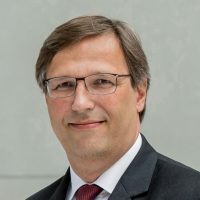 Dr. Stefan Mair is a member of the Executive Board of the BDI. He studied Political Sciences, Economics and Sociology at the Ludwig Maximilians University in Munich. From 1989 to 1991 he held a scholarship from the ifo-Institute for Economic Research. He was subsequently awarded his doctorate in Political Sciences by the Ludwig Maximilians University in Munich. In the following years he worked as an advisor on Africa at the Foundation for Science and Politics (SWP), becoming head of the research group Africa and Middle East at the SWP in 1997. From 2002 to 2010 he was a member of the management of the SWP and from 2007 to 2009 he also held the post of director of research. In 2010 Dr. Stefan Mair moved from the SWP to the Federation of German Industries (BDI). From May to October he was head of the Department of International Markets. Since November 2010 he has been a member of the Executive Board of the BDI.